We are proud to be recognised as one of Epson's main Printer Resellers in the UK and stock their full range. The printers, inks and papers that we use ourselves are Epson, which illustrates our commitment to and confidence in Epson products. We offer full installation, delivery and basic training. We also provide an after care service for all our customers to help you, should you need guidance. This ensures a minimum of fuss and disruption to your business. Epson Stylus Pro 4000 Series. Compact and robust, offering outstanding results up to A2 on a wide range of cut sheet and roll media. Epson Stylus Pro 7000 Series. The A1 Epson Stylus Pro 7450 series delivers fast professional prints with support for a wide range of cut sheet and roll media. Epson Stylus Pro 9000 Series. 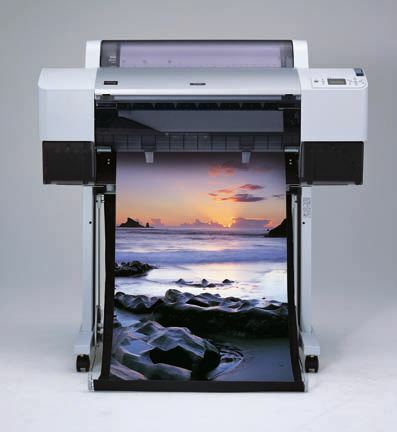 Go large with the Epson Stylus Pro 9450 series. 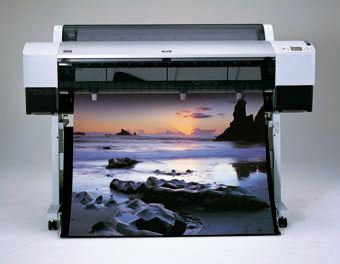 Print up to 44 inches on both cut sheet and roll media. Printing up to 64", the Epson Stylus Pro 11880 is our largest and most advanced printer yet. Epson's ink has been specifically designed to work with your Epson printer. For the best printing results, make sure you use only genuine Epson inks. You'll find a wide selection of paper media options to suit the individual needs of your home or office. We deliver fast and on time and you can rely on The Print Agency to give you great service.